Ewan MacColl is widely recognized as a key figure in the English folk revival, who tried to convey traditional music to a mass audience. Dominant in the movement during the 1950s and much of the 1960s, his position has come under attack in more recent years from some scholars. While it would be arrogant to claim to 'set the record straight', this book will contribute significantly to the debate surrounding MacColl's importance. MacColl gave two extended interviews with co-editor Giovanni Vacca in 1987 and 1988, not long before his death, and these provide the impetus for a re-examination of his methods, his politics and his aesthetic aims. The book also provides critical overviews of MacColl's activities in the revival and of his practices, particularly as writer and singer. The time is ripe for such a contribution, following Peter Cox's study of the Radio Ballads, and in the context of biographies by Joan Littlewood and Frankie Armstrong. The contributions locate MacColl in his own historical context, attempting to understand some of the characteristic techniques through which he was able to write and sing such extraordinary songs, which capture so well for others the detail and flavour of their lives. Great emphasis is placed on the importance of seeing MacColl as not only a British, but a European folk activist, through discussion of his hitherto barely known work in Italy, enabling a re-contextualization of his work within a broader European context. 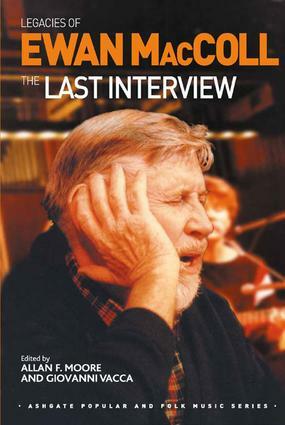 The interviews themselves are fluent and fascinating narrations in which MacColl discusses his life, music, and experiences in the theatre and in the folk music revival as well as with a series of issues concerning folk music, politics, history, language, art and other theoretical issues, offering a complete description of all the repertories of the British Isles. Peggy Seeger contributes a Foreword to the collection. Engaged, opinionated, furiously creative - the controversies Ewan MacColl generated in life have scarcely lessened since his death. His legacy of writing and activism continues, but folklore scholarship has moved on, so it is particularly appropriate that a re-examination of his multi-faceted and highly individual work is undertaken now. It is welcome - and also particularly appropriate - to see international perspectives developed on MacColl and his achievements. This is the sort of testimony historians are always hopeful of finding yet which often simply does not survive … This book gets us closer to MacColl’s thought than anything else easily available; in that it is greatly valuable. Contents: Foreword, Peggy Seeger; Introduction, Allan F. Moore and Giovanni Vacca; On interviewing Ewan McColl as a young student: the interviews, Giovanni Vacca; The first interview (London, 23 June 1987); The second interview (London, August 1988): part I: what is folk music? ; The second interview, part II: the ballad; Travelling people; The second interview, part III: folk culture and popular culture; The second interview, part IV: Scotland! ; MacColl and the English folk revival, Dave Laing; Form and content: the irreconcilable contradiction in the song-writing of Ewan MacColl, Giovanni Vacca; MacColl singing, Allan F. Moore; MacColl in Italy, Franco Fabbri; Bibliography; Index. Allan F. Moore is Professor of Popular Music at the University of Surrey, UK. His chief research interests lie in the domain of the interaction of music and lyrics in recorded song in the service of potential readings. He is series editor of Ashgate’s ’Library of Essays in Popular Music’ and author to date of five monographs including Rock: the Primary Text and Song Means (both Ashgate). Giovanni Vacca has worked extensively on folk music, folk and urban cultures and songwriting, and holds a PhD from Sapienza University of Rome. He has published Il Vesuvio nel motore (1999), on Neapolitan working class music, Nel corpo della tradizione (2004), an anthropological study on Southern Italy folklore and Gli spazi della canzone (2013), about the Neapolitan Song. He has occasionally written song lyrics for Neapolitan world music.